After the Second World War, it was obvious that Delft University of Technology, its buildings located in and around the city centre, needed larger premises to keep up with the growing number of students. The arrival of Marshall Aid as promised helped to get plans under way. The first scheme, by the then Government Architect Kees Bremer, was still fairly traditional in its conception. Subsequent plans gave the project its spine, a central avenue 100 metres wide (Mekelweg), with 200-metre-long 'ribs' of buildings housing the university's various departments extending from it. During the course of the 1950s and '60s the first educational buildings sprang up along Mekelweg, many designed by DSBV (Van der Steur and Drexhage) and Van den Broek & Bakema. 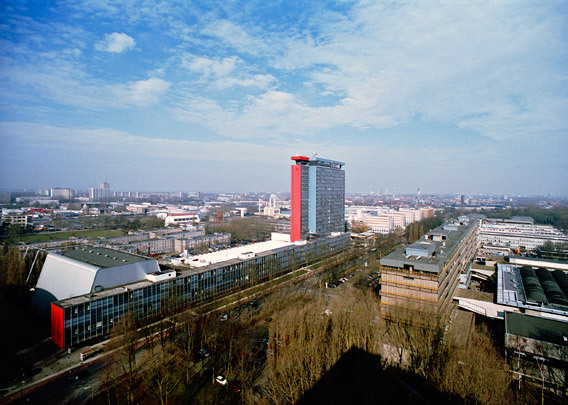 These were joined by other facilities elsewhere in the area: the latter firm's general assembly hall and a sports complex and from the late 1970s on, student digs, beginning with semipermanent accommodation (Gimmie Shelter) designed by Delft architecture students and demolished in 2005. The 1990s saw the construction of more student housing and Vera Yanovshtchinsky's music centre, a red brick block hovering above a bicycle garage. With the arrival behind the general assembly hall of Mecanoo's Central Library the TU Delft finally took leave of the town centre. The university buildings built round Kanaalweg and Julianalaan at the beginning of the 20th century now have new duties to perform. Francine Houben of Mecanoo has drawn up a masterplan to restructure the campus.